If you are looking for ways to connect your business with other influential business leaders in the Reno-Carson City area, Northern Nevada Business View has you covered. 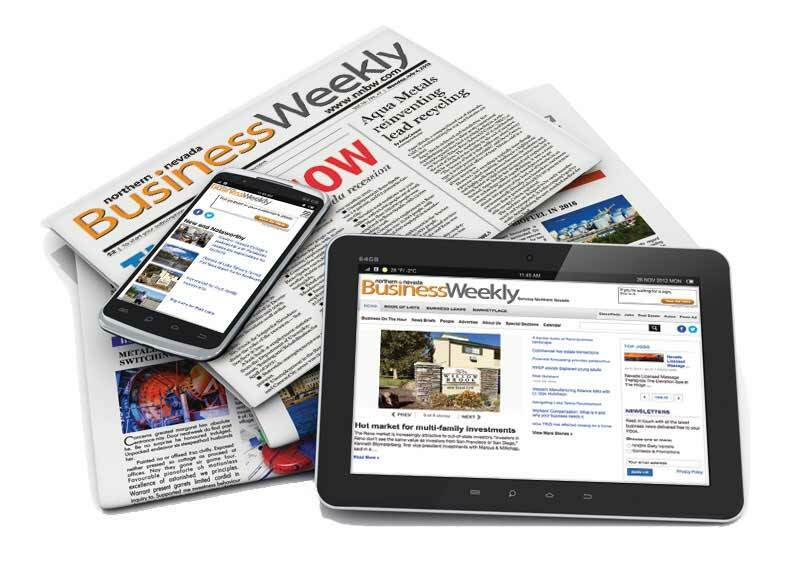 Our weekly publication delivers the important news local business owners need to know. The Northern Nevada Business View will deliver your marketing message to over 12,000 business decision-makers with the weekly paper and a mix of sharply focused special reports, industry-specific sections, social media accounts and business stories allow you to further build brand awareness among your most important business customers and high-end consumers. The diverse media mix the Northern Nevada Business View produces will get you in front of business leaders you want to target as potential clients. Online, www.nnbusinessview.com receives 5,826 unique visitors every month. Each week, the email newsletters Northern Nevada Business Weekly sends receive a 34% open rate. Our marketing opportunities can help you advertise to local customers in Northern Nevada as well. Please speak with one of our account managers today to learn more about reaching an audience located in Carson City, Lahontan Valley, Carson Valley and Lake Tahoe.